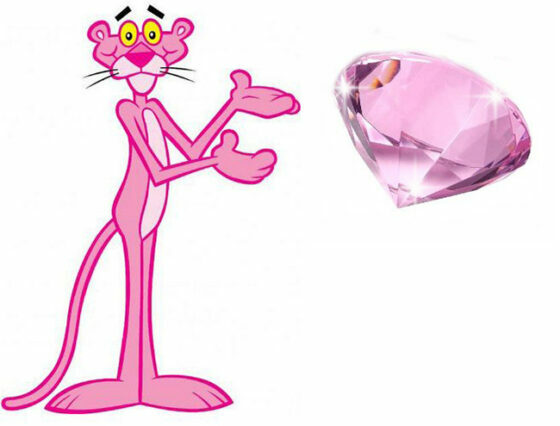 The Pink Panther is a fictional diamond with a distinctive flaw which resembles a leaping panther. The diamond was a major plot device in a series of films which are collectively known as the Pink Panther movies. The Pink Star (formerly known as the Steinmetz Pink Diamond) is classified as a vivid pink and weighs 59.60 carats. It was discovered in Africa and is the largest Fancy Vivid Pink diamond in the world. This diamond was first shown in 2003 in Monaco. Eight jewelers took 20 months to create this internally flawless diamond, making over 50 models before cutting the real diamond.